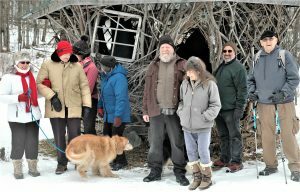 Hilltown Land Trust held a hike in January at Earthdance, an artist-run workshop, residency, and retreat center in Plainfield. Below is a summary of that event, written by HLT TerraCorps-AmeriCorps member Susan Schroder, who organized the event. When we arrived at Earthdance, staff member Victor Mistretta invited hikers into the warm main building while we waited for the hike to begin. Once outside again, we got to examine the “Twig House.” This intriguing structure is a fascinating example of the whimsical nature that infiltrates some of Earthdance’s events. It was made several years ago during an interdisciplinary arts and ecology festival. Inside it is a circle of soft chairs intended to be used for those needed moments of respite and quiet conversation. This whimsy and emergence into the natural world was seen again while hiking when we passed an old tree house and numerous tent platforms, then discovered a firepit next to a waterfall that was solid ice. During much of the hike, one of our participants shared her tracking skills and engaged us in identifying tracts in the snow- fox, deer, and squirrel. And like many other Hilltown Land Trust events this year, after days of heavy cloud cover, the sun managed to shine on us. That was definitely magic! When we returned to the main building, Kelsey Hobbs, the Program and Development Manager for Earthdance welcomed us and shared Earthdance’s vision and the nature of the events they schedule. Earthdance’s Executive Director, Deirdre Morris also greeted us before we were led into the dining room for lunch. The main chef, Ali Skalli, and the kitchen staff presented us with a large selection of tasty, vegetarian food and a graciousness that is rare as they checked to be sure all was good. It was, and we lingered over food and conversation. We hope to collaborate with Earthdance again on future events!